Innovate UK has awarded funding and support to 9 of the UK’s most innovative female-led businesses, as part of its campaign to boost diversity in innovation. The winners of the 2019 Women in Innovation awards have been announced today, International Women’s Day. The awards are part of Innovate UK’s Women in Innovation campaign, which aims to encourage female-led innovation and help women achieve their business ambitions. The 9 entrepreneurs will receive £50,000 business funding and a package of bespoke support to help grow their business and boost the UK economy. 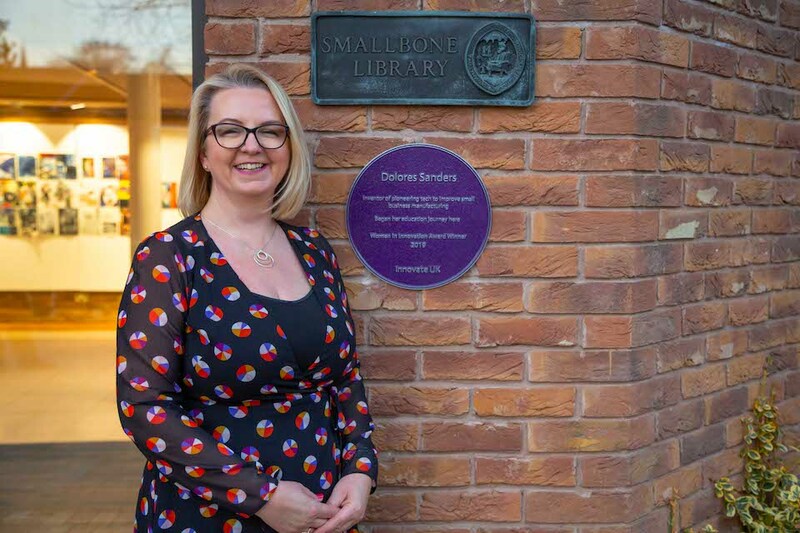 To further inspire future innovators and celebrate the winners’ achievements, Innovate UK has partnered with schools across the UK to install commemorative purple plaques. Cintia Kimura, founder and COO, KG Protech. Changing the world: read the brochure introducing 2019’s Women in Innovation winners. The winners are tackling some of society’s biggest challenges set out in the government’s modern Industrial Strategy, including artificial intelligence (AI) and the future of mobility. The winning women are developing pioneering innovations to tackle the grand challenges we face as a society, from a new paper coating to cut down single use plastic, to helping us train mechanics using simulators. This is our modern Industrial Strategy in action, backing businesses of all sizes across the UK to grow and boost the economy with the skills and inventions we need for the next generation. Find out more about the Industrial Strategy’s Grand Challenges. Dr Fanya Ismail, CEO & founder of SGMA, is developing a plastic-free coffee cup coating. Alex Haslehurst, co-founder and CTO, Vitrue Health. It’s such a huge encouragement to be recognised for the work you’ve done. If my story can motivate more women like me, that will be a really exciting part of the journey. Sheana Yu, founder & CEO of Aergo. Read about Innovate UK’s Women in Innovation campaign. Innovate UK launched Women in Innovation in 2016, after research revealed that just one in 7 applications for Innovate UK support came from women. Boosting the number of female entrepreneurs could deliver £180 billion to the economy. By running a women-only competition, partnering with Getty Images to create stereotype-shattering portraits of female entrepreneurs, and running a mission to Boston for women in tech, Innovate UK increased the proportion of females registering for Innovate UK support by 70%. To continue to energise the next generation of innovators, this year Innovate UK has partnered with schools across the UK, installing commemorative plaques from Forfar, Scotland to London recognising the winners’ innovative businesses. Currently, just 14% of blue plaques in the UK celebrate the achievements of women. Dolores Sanders, Strategic Director of Total Control Pro Ltd. Innovate UK’s Women in Innovation Awards address a key barrier for diversity in innovation - a lack of female role models. By recognising their achievement with purple plaques, we are making sure that our 9 newly-crowned winners inspire the next generation of female innovators. Whether it’s inspiring young students showing a passion for STEM, someone with the spark of an idea or an innovative business ready to be taken to the next level, the Women in Innovation 2019 campaign aims to drive long term and far-reaching change. Read about Innovate UK’s commitment to diversity and inclusion.